"Before the Dark Times. Before the Empire." From the ashes of the Republic rises the dread Galactic Empire. The Sith hold the fate of the galaxy in their iron grasp, and the Rebel Alliance is still years away from formation. In these dark times, is there any force that can challenge the tyranny of the Empire? * A complete campaign setting for the time between Revenge of the Sith and A New Hope. * Exclusive content based on the exciting LucasArts multimedia event, The Force Unleashed. * New character options that expand and intensify how the Force can be used. * A detailed look at the Galactic Empire, its minions, and its technology. 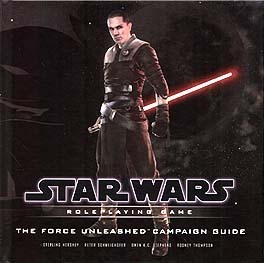 * To use this accessory, players and Gamemasters also need the Star Wars Roleplaying Game Saga Edition core rulebook.